One of my articles about Seattle Hempfest this year. To read the version on The Daily Doobie website, click on the link. This article covers the activist roots and the political protest messages for the first Hempfest after the passage of I-502 in Washington. In its 22nd year, Seattle Hempfest is the largest cannabis event in the world, with a quarter million happy and blissed out people attending the protestival, one part festival and one part protest. Seattle Hempfest, which is free and open to the public. It is one of the most inspiring experiences a cannabis activist and enthusiast can experience. It’s a mile and a half long celebration of cannabis culture and a festival where people can safely consume marijuana publicly and enjoy a beautiful day in the park, with entertainment, a vibrant marketplace, food and food for thought. The recent passage of Washington’s marijuana legalization law, I-502, had voters and cannabis enthusiasts ready for a public celebratory toke at Seattle Hempfest this year. Although it is still illegal to publicly smoke marijuana in Washington, within the safety of Seattle Hempfest, people smoked, vaporized and consumed cannabis. With great enthusiasm, people took hits from four and six foot bongs, and socialized with circles of friends or friendly strangers while passing around enormous joints. The overall effect was a peaceful and happy crowd. 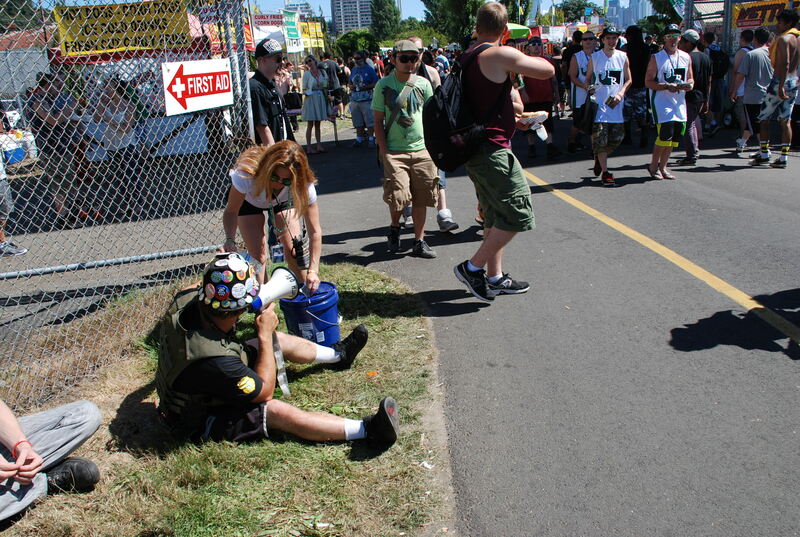 Seattle Hempfest is an event where people can safely consume marijuana publicly without fear of arrest and prosecution. As trivializing as this act may be perceived, public marijuana smoking is a form of protest. The nonviolent protest is the heart of Seattle Hempfest. The roots of Seattle Hempfest began in 1991 as the Washington Hemp Expo. Five hundred people turned out to the event organized by the Seattle Peace Heathens Community Action Group. The Seattle Peace Heathens were a voluntary group of alternative cultural advocates who produced and promoted peace and social justice community projects. The Washington Hemp Expo touched a nerve in the community and the event grew exponentially every year. By 1994, the growth of the event, now called Seattle Hempfest, was raising the attention and concern of local government and law enforcement, which had been turning a blind eye to the unpatrolled event. With the help of the ACLU, Seattle Hempfest was identified as a legitimate political rally, and not a “pot party” as detractors wanted to categorize it. Seattle Hempfest had a counter- cultural flamboyance, but was professionally savvy in negotiations with local agencies. Seattle Hempfest has expanded from a one day event to three days. The crowd attendance has grown from 15,000 people to 250,000 people. All of this growth would not be possible without the planning and consistent effort of dedicated volunteers who have met the increasing logistical demands and more complex permit requirements with the city government. Over the weekend of Seattle Hempfest, the number of volunteers swells to over a thousand as all event activities are coordinated to keep everything running smooth and safe 24 hours a day. This year, Seattle Police Department received praise and chuckles for handing out Nacho Cheese Doritos to people attending Hempfest. Affixed to the snack bags were informational and joke riddled stickers advising the festivalgoers some of the new marijuana regulations with I-502. Among the text was “This sticker is not a lawyer and cannot provide you with legal advice.” And “The contents of this package are as delicious as they appear”. One key part of visualizing the annual political protest message of Seattle Hempfest is the event poster. Past images evoke and depict messages of peace, hemp agriculture, and awareness of nonviolent prisoners, public education, and idyllic scenes of future possibility. Poster images have captured the fundamental messages of political protest at Seattle Hempfest. This year’s poster uses a popular image for the federal government: the iconic Uncle Sam is passing a lighted joint in front of a glowing Emerald City. “I want YOU at the Seattle Hempfest” is what the headline reads. Marijuana legalization has not been the only political destination for Seattle Hempfest. Previous years, a single protest message was crafted and presented to bring attention to different issues related to marijuana prohibition. To demonstrate marijuana reform has made a significant progressive step but has not reached its destination three protest messages were emphasized this year. The first Seattle Hempfest protest platform is “eliminate marijuana from the Federal Schedule.” As you may know, the Federal Schedule is the federal drug policy that lists marijuana as a controlled substance and having no current medical use in treatment. Schedule 1 substances are legally defined as highly addictive and have the most restrictive laws regarding use, possession and distribution. Seattle Hempfest recommends going beyond moving marijuana from its current schedule status, and moving it completely out of the Federal Schedule. The reasoning for this is the two most widely consumed drugs, recreational alcohol and tobacco are both exempt from Federal Scheduling. Marijuana with its relative history of safety should also be exempt. The second protest platform is “harm reduction.” Harm reduction measures usually includes efforts to change the impact in society of mass incarceration for nonviolent drug offenders and related injustices. Seattle Hempfest is shifting harm reduction to a personal level with a series of health pamphlets called, Cannabis Gut Checks. These pamphlets share information on recent scientific studies relating to topics of health and safety of cannabis use and depression, driving, health, lungs, memory, mental health, pregnancy and teens. The pamphlets candidly discuss the risks of cannabis use and provide the reader with additional resources for information. 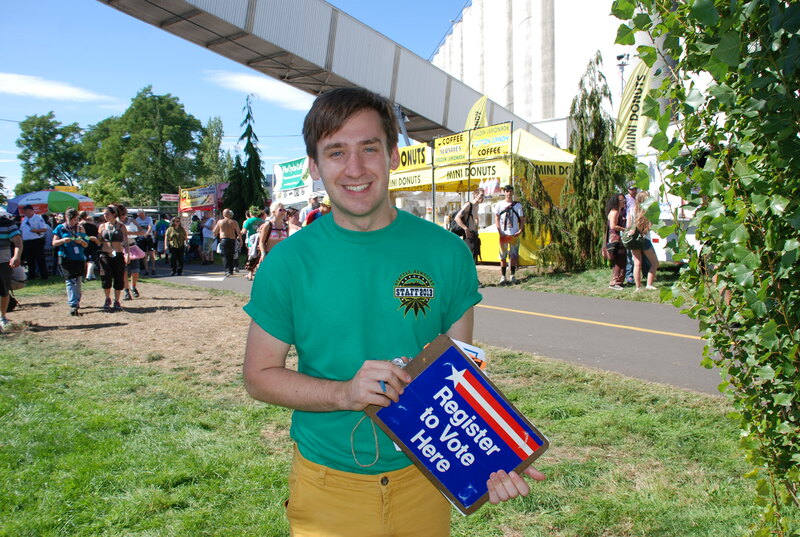 The third protest platform is “voter power.” To harness the right in our representative democracy, Seattle Hempfest encourages voter registration. 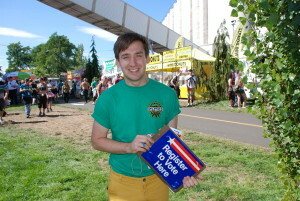 The Hempfest Voter Registration team members walk the festival with clipboards and knowledgably answer questions and help register Washington state voters. They assist voters with changes of address, register newly eligible voters who are turning eighteen, and field questions regarding the eligibility of convicted felons, who have recently been restored the right to vote in Washington. Political protest happens all day from the stages, the shouts of call and response engage the crowd as HEMP is repeatedly spelled out with a “give me an H, give me an E” In between band sets, notable luminaries from Washington, Oregon, California and Vancouver give encouraging, engaging and informative speeches. Speakers include Seattle and Washington elected officials, activists, legislative advocates, lawyers, doctors, patients, writers, growers, and directors of national drug reform organizations. A longtime Seattle Hempfest favorite is Elvy Musikka, a medical marijuana patient, who since 1988 has received 300 joints a month from the Federal IND program. Seattle Hempfest is an amazing and inspiring event for cannabis activists and enthusiasts. It is a focused cannabis reform rally, a gigantic celebration of culture and music, and a weekend where people are free to consume marijuana safely in public and enjoy a beautiful day on a waterfront park with a lot of smiling people. Seattle Hempfest is the largest cannabis event in the world and at its heart is the belief nonviolent protest can create positive change. You’ve got to see it to believe it.